If you're a birder in New Jersey, chances are you make the same trip every winter: you take the walk along the jetty at Barnegat Light to see the Harlequin Ducks. They're cool little ducks that look like a paint-by-number project, with well-defined blocks of colorful plumage. Big fans of the rough-and-tumble waters next to rocky coastlines, they hang out next to the rip rap that forms the jetty protecting the eastern end of the tip of Long Beach Island from massive erosion. Brr. This is the usual frigid jetty walk. That dot to the right is Ivan. Usually, Ivan and I visit Barnegat in January for a reliable look at the ducks along with Great Cormorants, Common Eiders and Purple Sandpipers. Without fail, the weather is cold and blustery, with gusts coming off the ocean, but Ivan's a man on a mission to see 100 bird species before the end of the month. 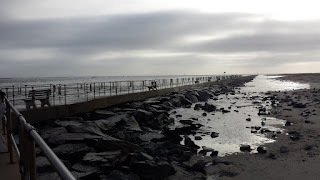 More often than not, I only walk halfway down the jetty before I give up and climb down to the beach, while Ivan swings his spotting scope on his shoulder and tromps down to the birds' preferred haunt, the end. This season, we thought we were in luck. 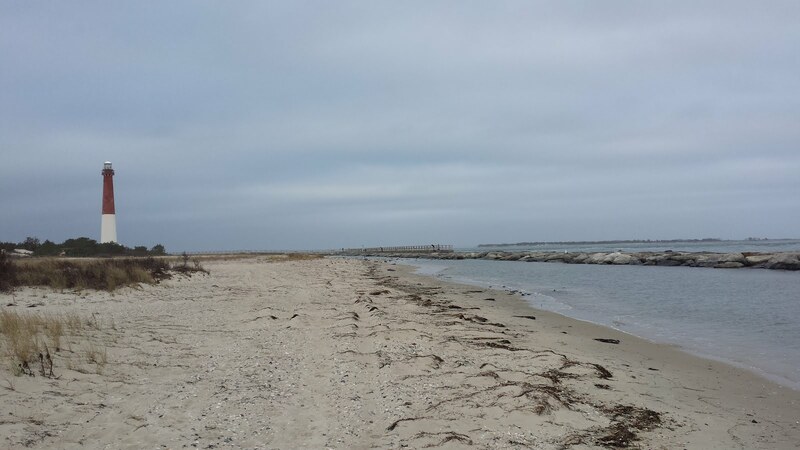 On our planned Barnegat Light day, the weather was in the downright balmy 50 degree range, and the predicted rain was holding off for at least a bit. Would this be the year we got the birds without the frostbite? Or would we discover that the desired birds hadn't yet arrived since their more northern territories hadn't frozen up yet? Our first stop was just outside Barnegat Light State Park, where we discovered a large group of Boat-tailed Grackles perched on the power lines. Hearing a gentle "plop" in their general direction, I warned Ivan that we might be in for a Mel Brooks "High Anxiety" moment, but fortunately the birds played nice. Still, though, their presence was a bit off season, adding a bit of concern about whether the ducks were around. After Ivan's customary pause to pay homage to Civil War General and lighthouse architect George Meade, we turned to start our way down the concrete platform that wraps around the northern edge of LBI and leads to the jetty on the eastern edge of the park. A few birders were clustered at the bend in the walkway, but nobody was going any further down. In a moment we knew why: waves were crashing against the jetty with such force that buckets of salt water were leaping over the walkway. Neither of us had ever seen puddles on the land side of the jetty, yet here they were. Oh crap. We weren't seeing any water-borne birds from our vantage point. They all notoriously prefer the area farther south of where normal people would hang out, and the frequency of the breaching waves was enough to nix any thought of making a run for it and hoping for the best. 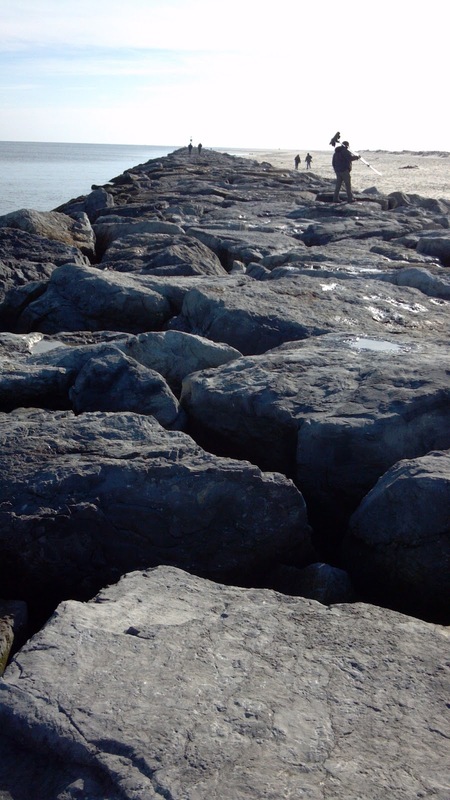 I myself wouldn't feel comfortable risking the walk across the rip-rap jetty. The view looking north from the beach. 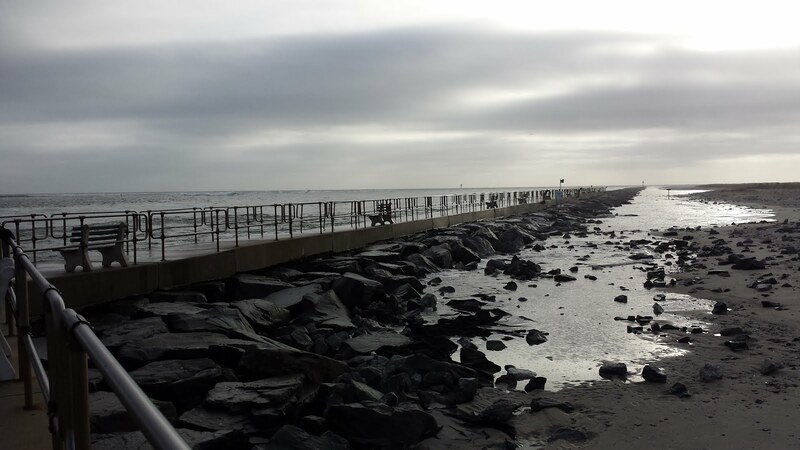 That water to the right is what washed up over the jetty. Never one to declare defeat easily, Ivan reasoned that we'd just have to walk down the beach. Fine by me. Maybe we'd be able to get on the jetty farther down, or maybe the birds would be someplace we could see them. Either way, we weren't giving up. We'd driven all that way, and the chances of getting back to Barnegat before the end of the month were pretty much nil, so we had to make the best of this visit. Maybe we'd find some unexpected species along the way. You never know. And indeed we did, hiding in the detritus along the tideline. If I hadn't seen the movement out of the corner of my eye, we would have missed a couple of Ruddy Turnstones foraging for food. Maybe they were a little freaked by the weather, too, as they didn't appear too worked up about us being just steps away. Our reward for all that walking was a host of ducks braving the rough waves in the waters off the beach just west of the end of the jetty. Difficult as they were to focus on as they bobbed up and down on the surface, we eventually ID'd not only the Harlequin and the Common Eider, but found some Black Scoter and Long-tailed Ducks, too. And a Great Cormorant was perched, as is customary, on one of the towers out in the water. Satisfied, we made our way back toward the lighthouse, happy to have made the call to walk the beach. Nature wasn't done with us, though. As if on cue, a small bird flew past us to perch on a bush along the dune. A run of the mill sparrow perhaps? No, a Snow Bunting, a bird we thought we'd have to make another long drive to find this month. Maybe the birding gods were smiling on us after all. At least we got our reward for persistence.